The thermometer without contact has been developed by using the latest infrared technology. It allows temporal artery (TA) temperature to be taken at a distance of about 3~5cm away from the forehead. 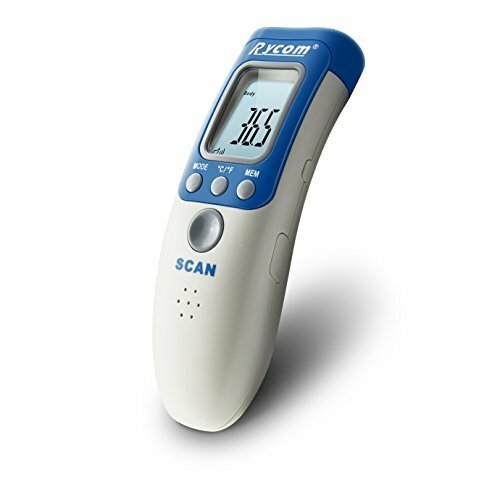 Precise, Instantaneous and without Contact, the Rycom Infrared Thermometer is, up to now, the most suitable thermometer for no risk on temperature measurement. It has been demonstrated that this method of TA temperature measurement is more precise than the tympanic thermometry and better tolerated than rectal thermometry. 1. Press the scan button to power on the thermometer. 2. Aim at the FOREHEAD, over the right temporal region, from a distance of 3 ~ 5cm (1.2 ~ 2in). RELIABLE AND PROFESSIONAL: Care for your children painlessly with the (non-contact infrared thermometer) laser mode. Can measure (forehead, surface and ambient temperature) With (one Year Warranty). Longevity use (about 40,000 readings) with memory functions for your continuous use, durable with high quality. SIMPLE TO USE: Just Point and Click from (3cm - 5cm away from side of the forehead) without disturbing or touching the patient and avoiding cross contamination. READINGS RETRIEVAL: Can store and recall (up to 32 readings). Display reading in (Fahrenheit or Celsius). HIGH LEVEL AUTOMATION: Automatic power-off (30 seconds) to conserve energy. And audible alarm if temperature is more than 38℃(100.4℉).Take the guesswork out of determining your child's temperature! View More In Baby Thermometers. If you have any questions about this product by Rycom, contact us by completing and submitting the form below. If you are looking for a specif part number, please include it with your message.